It could be a hard-fought three setter between tennis legend Margaret Court and proponents of gay marriage such as Kerryn Phelps over Court’s uncompromising views on the topic. Dr Phelps has tweeted a call to Victorian Premier Ted Baillieu and Tennis Australia to rename the Margaret Court Arena before the Australian Open in Melbourne next week. And there has also been a call for people to protest by displaying rainbow flags at the tournament. 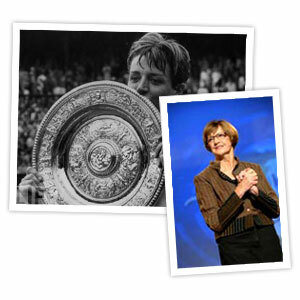 Pastor Court, a winner of 62 Grand Slam titles and now senior minister of Victory Life Centre in Perth, said she was ‘sad’ that her views on marriage were being brought into tennis, but that she would not be running away. A Facebook page, ‘Rainbow Flags Over Margaret Court Arena’ has attracted 660 Likes while a recently added ‘NO Rainbow Flags Over Margaret Court Arena’ so far only has two. However many comments on the former page are actually in support of Margaret Court. In The Australian, Ps Court explained that her views on gay marriage were based on the Bible and that she did not hate homosexual people. “I have always said I have nothing against homosexual people,” she said. “We have them in our church. I help them to overcome. We have people who have been homosexual who are now married. “When I spoke a month ago and stood for marriage, things came back from tennis players who probably didn’t read what I wrote. It had nothing to do with people personally or tennis players. I remember speaking to Navratilova 10 years ago on something she brought up with me and I said ‘Martina, I love you, God loves you, but a wrong doesn’t make a right’. “I think I have a right, being a minister of the gospel, to say what it says from a scriptural side. While Pastor Court’s views have been consistent and well-known for a long time, she spoke out on her blog in August about family and marriage and also during the gay marriage debate at the ALP Conference in December. Posted in Australia, God-spotting, News, Sport.Tagged Australian Open, Grand Slam, Kerryn Phelps, Margaret Court, Tennis Australia.